I did it! I signed up for my 1st 21k half marathon! The event shall be Condura’s Run for Dolphins Feb 7 Race. I need to start my serious training stat! Problem: Business travels for me start early every year and normally lasts until mid year, tapers on the last weeks of Q3. And this year, it starts with a 6-day Asian Cruise, an incentive for our valued partners. Photographer, Babysitter Gail signing in. With only less than 6 weeks before race day, I wondered how I can squeeze my exercise regimen during this trip. Jan 9, we left Manila early to fly to Singapore. 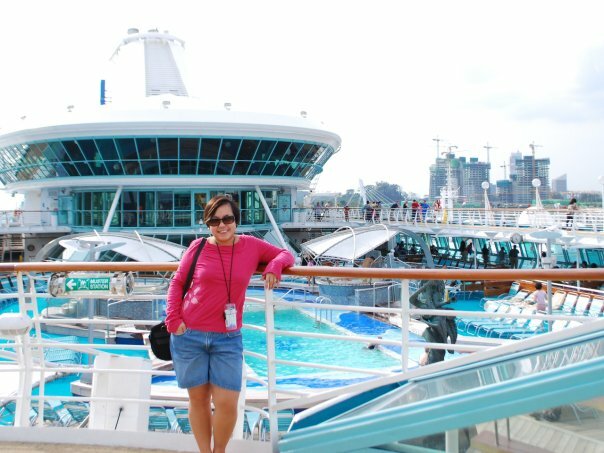 Was able to board Legend of the Seas (Royal Caribbean) past 1pm. I was famished and the lunch buffet was sumptuous. I gave in…ate as much as I can and promised that I will burn what I ate in the gym. 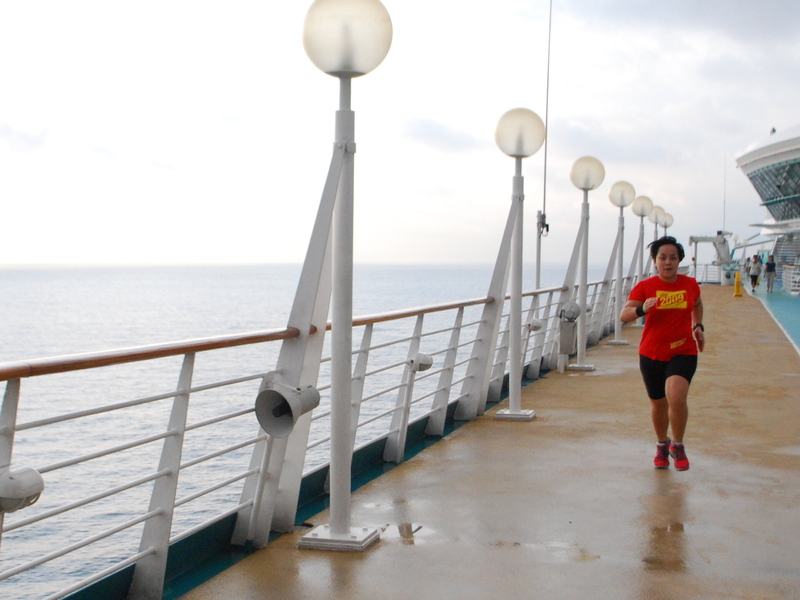 I had hoped that the ship had a jogging path (most do) where I can run as to not interrupt my training. As soon as we finished lunch, we checked out our statesrooms, dropped off our stuff, freshened up and explored the ship. 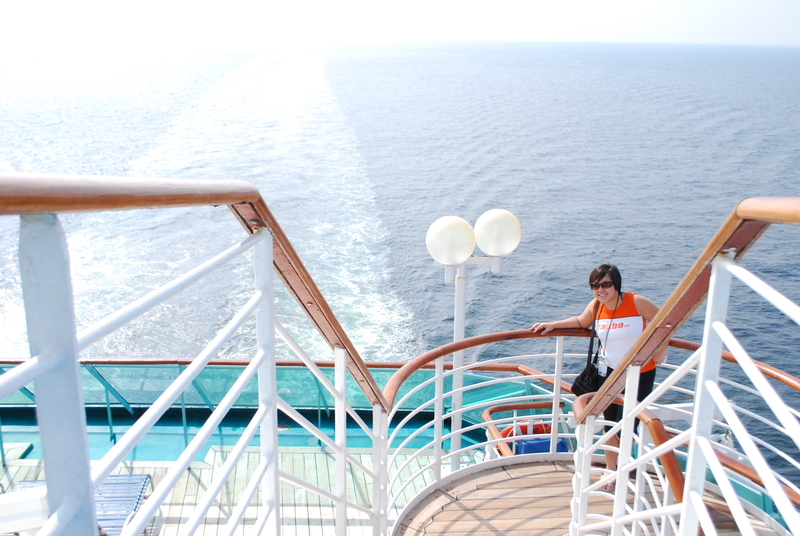 I headed directly to the upper decks where the pool was to see if where I can run. 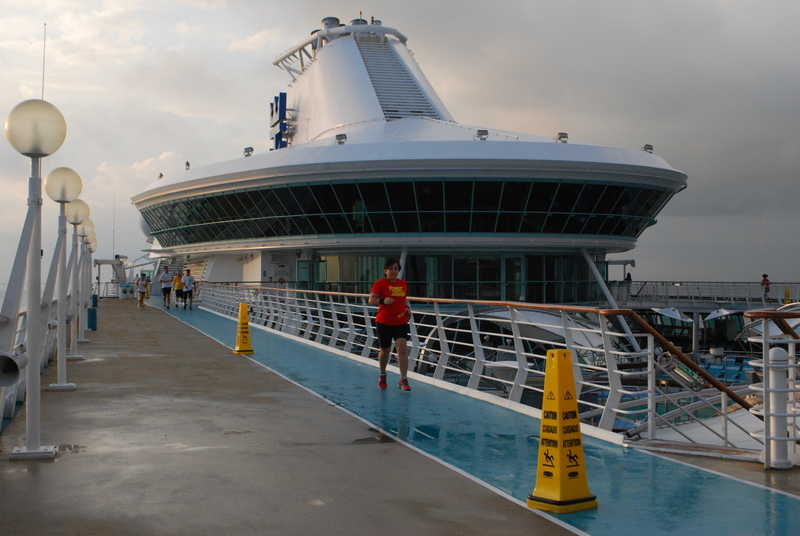 Thankfully, the ship had a jogging path on the upper deck! 😀 It measured about 400m per lap (4 laps was equivalent to 1 mile). I promised myself I will run 1st thing tomorrow morning. 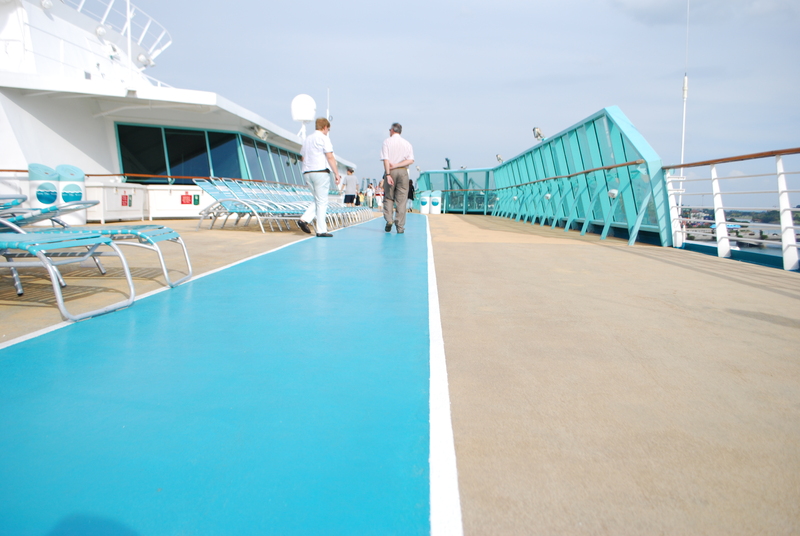 Surprisingly, even if the deck was wet, it wasn’t slippery at all. I enjoyed the relaxing pace. My Garmin’s GPS was screwed up of course. I was on a moving ship. It would’ve been a great thought if my pace was indeed 1.3m/km and I did 24k in about 30mins+. Haha! After 5k or so, I had to stop as I needed to do my morning duties (eg plan for today’s schedule etc). The sun was already up and it was a beautiful day. I woke up my girls/kiddies (people who I babysat), set their schedules and decided to run a bit again before breakfast. Ivy took my picture during my 2nd run. Jan 11 (Mon) No runs for me. We had to wake up early as we headed to Phuket. Jan 12 (Tues) Managed to squeeze a 2k+ run. Was exhausted from the night before and had to leave the ship for Langkawi at 815am 😦 Wall-climbed. If you can't run, wall climb! Jan 13 (Wed) No runs. Disembarked for KL. 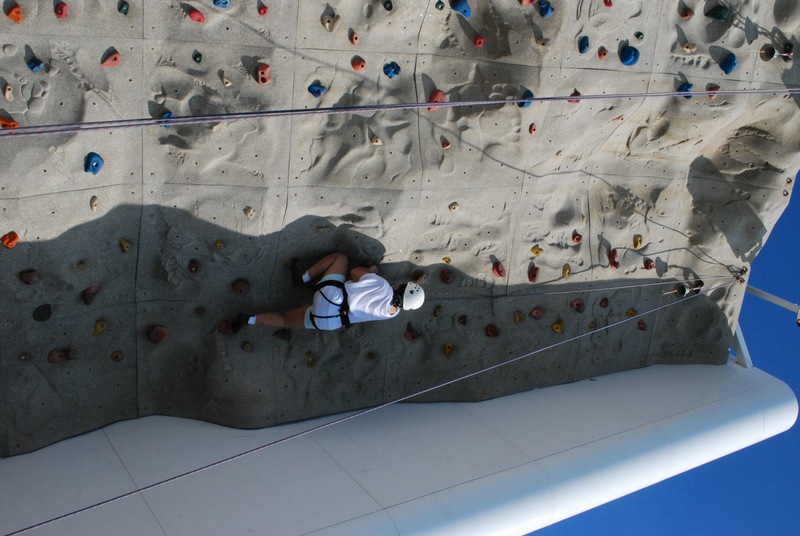 Went to the sauna, swam and wall-climbed. Jan 14 (Thurs) Departing at 8am for Singapore. Departed for Manila by 5:30pm. Great…now I am totally screwed. Condura’s only 3 weeks away and this has been my lousiest training history since I started running. Well, tomorrow’s another day. Time to put training face, mind, body, soul and everything else to work. Wish me luck! Wahahaha Gail. Palit muna tayo ng work para maka train ka! pareho kayo in tita Tiff. Try to squeeze in a 15K run and you should be okay for condura. huhuhu! anxiety over my 1st 21k is giving me sleepless nights! waaaaa… i was dreaming of running through the skyway last night. haha!